Working with a cross-shaped layout, Chris addressed the space as an exploration of open plan where the point of intersection acts as the pivot or ‘knuckle’ at which the ground and first floors meet and radiate off to the more private bedroom and living- area wings. 'Throughout the design there was a deliberate intent not to compartmentalise the different rooms yet avoid the creation of a typically predictable open-plan space,' explains Chris. Circulation through the house is centred on this joint where two double-curve staircases frame the circular formal living space below. Slightly sunken and accessed by a nautilus shell-inspired spiral ramp, the novel tasselled boundary defines the departure from enclosed to open space. Interior designer Maira Koutsoudakis of Life conceived the residence’s exuberant eclectic detailing. 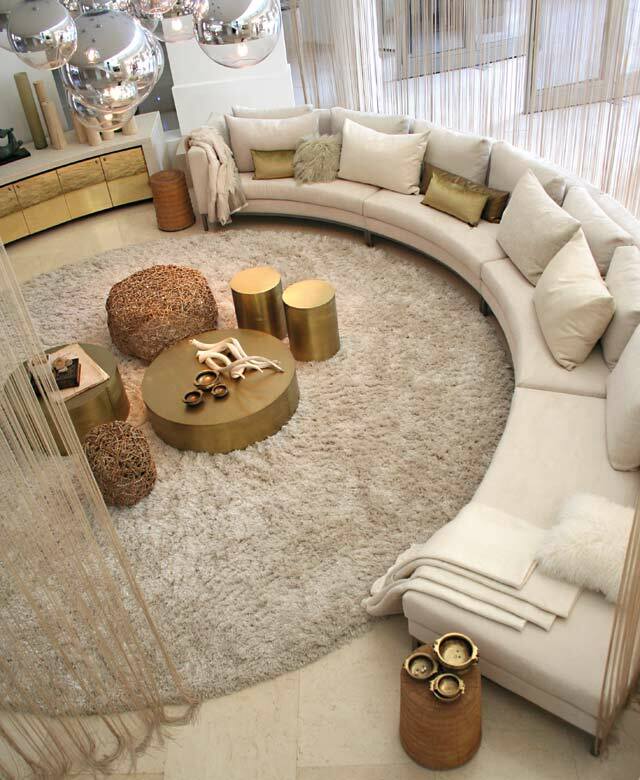 Of its living room ‘tour de force’ – a cocooned splendour of suede, leather, mohair and silk offset by brass, stone, wood and marble finishes – she says with tangible passion, 'I wanted a sensory overload of sensual textures and diverse materials.' It is this smorgasbord of organic shape and tactile sumptuousness that distinguishes the signature experience for which Maira is celebrated. In fact, the challenge of creating a home in which bespoke contemporary comfort would parallel the luxury of a boutique hotel provided the ideal platform for consolidating Life’s superlative portfolio of residential and multi-award-winning hospitality projects. Above Picture: Monochromatic needn’t be mundane. In this contemporary formal living space, abundant finishes and a rich textural diversity feed a neutral scheme with subtle yet effective visual interest. Metallic accents lend a further appeal, while a repetition of shape establishes a harmonious anchor. Above Pictures: Consider value contrast. In a space comprising a predominant neutral finish or colour – in this case brassy gold – ensure that a couple of strategically placed items break with a contrasting tonal value. Here the impact of the reflective, metallic quality is actually enhanced by the dark wingbacks, pendant light-fittings and ottomans. Albeit easy on the eye and, consequently, encouraging the sense of spatial fluidity, the neutral colour scheme is anything but a bore. 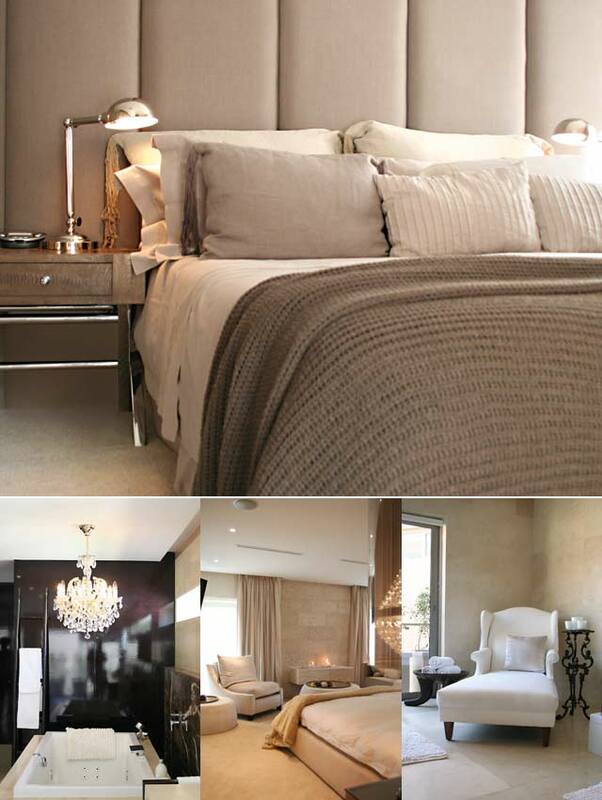 Maira describes the main bedroom as a 'palette of serene blondes' and the en suite bathroom as 'ultimate luxury in a chocolate and mink-coloured nutshell'. Indulgent formal areas lapse effortlessly into those of casual functionality, yet through the use of value and texture contrast each space remains a unique encounter. Moving through the home is a little like viewing the changing scenes of an effortlessly run stage production. Below Pictures: Multiples are marvellous. 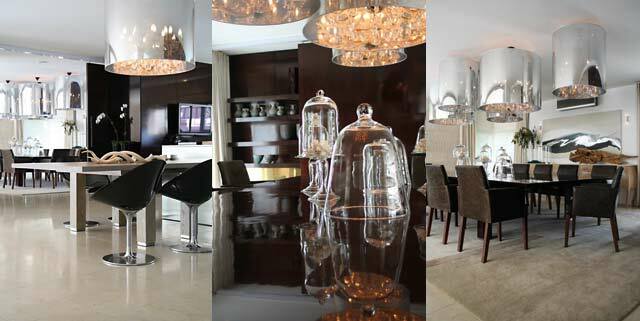 Award-winning interior designer Maira Koutsoudakis of Life is well-known for grouping striking light-fittings together in same or differing level clusters. Not only does this impart much-needed rhythm and movement to a space, but it’s an inordinately effective way of creating an arresting artistic focal point – essential to every interior. It displays a carefully implemented partnership where the extravagant interior elements work to complement the languid informality of the containing space. Further enhancing the concept are features exploring the fine line that diffuses internal and external, custom-designed pivot louvre doors create an undefined threshold between the patio and living areas. With adjustable tinted glass panels that can be angled at varying degrees to control the penetration of sunlight entering the home, they are a seriously 'Go wow!' feature that run the length of the primary ground-floor areas. Spatial surprises abound. Mimicking the containment of a Russian Matrushka doll, the suspended home theatre mirrors the circular formal living area below, its weightlessness presenting another ambiguous relationship between positive and negative volume. Accessible via a bridge, it is a ‘destination’ space that almost manages to upstage the impressive sunken living area and the extraordinary bar. Where possibilities for deluxe entertainment meet contemporary comfort, it’s five-star living without leaving home. Below Pictures: Bedrooms are for calm composure. When it comes to bedrooms, especially for guests, it is better to err on the side of colour caution. The intention is to induce a sense of peace and tranquillity. Unless it’s your own (and colour is your thing! ), use colour prudently as an accent on accessories such as scatter cushions, throws and ornaments. Below Pictures: View spaces with perspective in mind. If you’re confronted with the layout of a large space – here an 80sqm 'spa' bathroom – break it down into smaller visual perspectives. The proportions of this elegant recliner and the decorative classicism of the crystal chandelier make for points of depth and height upon which the eye will pause.